Karzanhi turned out to be a mix of both disappointment and interest for me; while there are things I specifically hate about the design I find it to be a very interesting set and a great collectible. 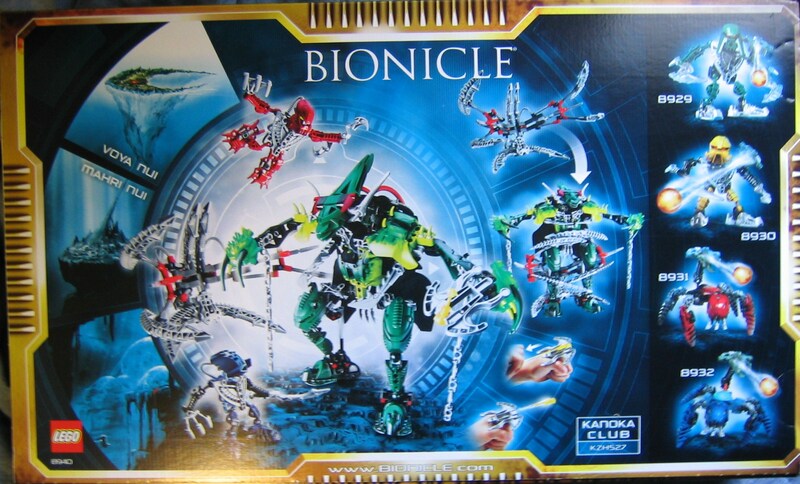 I'd only recommend him to people who specifically like to collect every single BIONICLE® set, and at that my recommendation wouldn?t be necessary since you?d be getting him regardless, but if your picky and have a budget then you may want to read about him and consider if you want him with your limited budget. 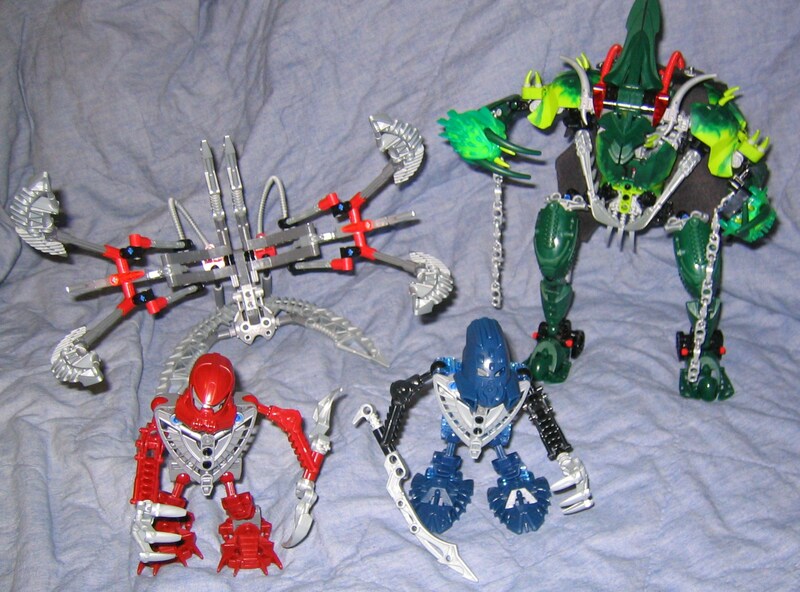 Karzahni is a bundle set if you ask me, two Matoran, the trap, and a titan set altogether, I value Karzahni at about $20.00 USD, $5.00 for each Matoran, and $10.00 for the trap, which adds up to about $40.00. You?re not really saving money on the set but you?re not overpaying for what you get. 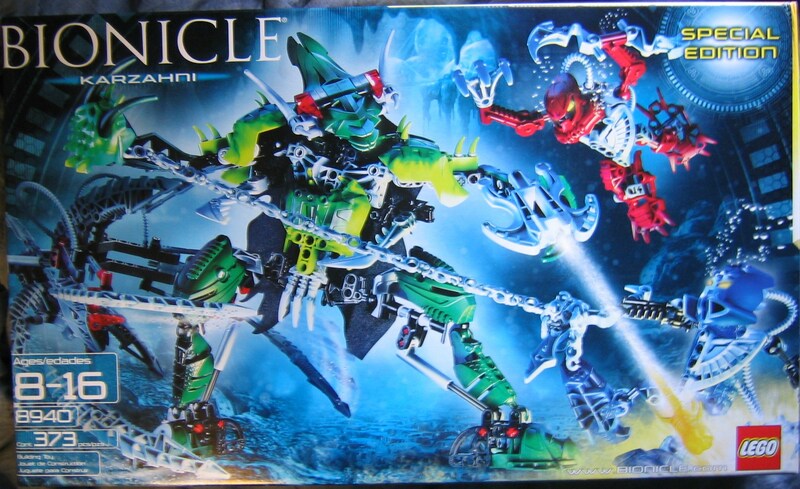 This set is designed to be played with, but I think it's more of a collectible and a piece to be displayed, especially Karzahni who looks great, though a lot of his design is simple. He's your basic titan, no mechanisms, and mostly decorative. 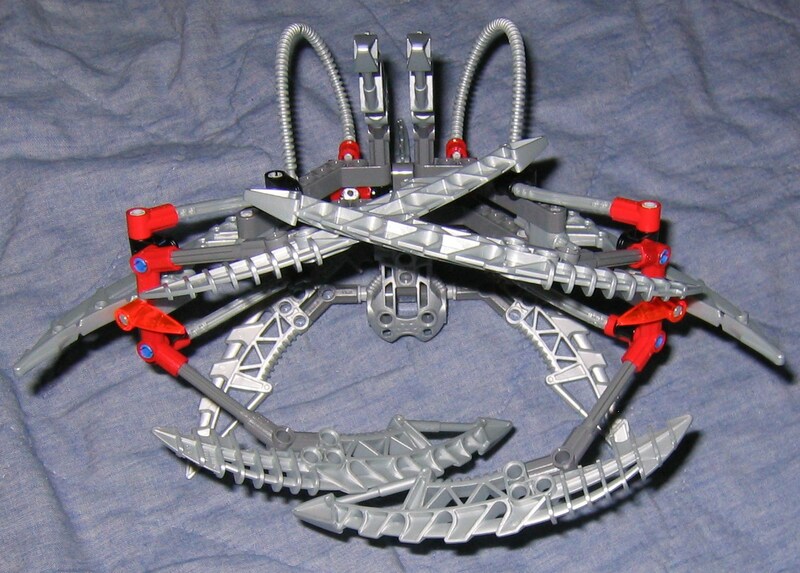 He is built wide, in fact almost too wide for him to fit in the trap that I believe is designed for him, since the trap seems optimized for a tall catch and even when adjusted lower seems to barely miss the Matoran. Karzahni lacks primarily in his legs and feet, which are quite bare unless it has some storyline value that I?m not aware of. 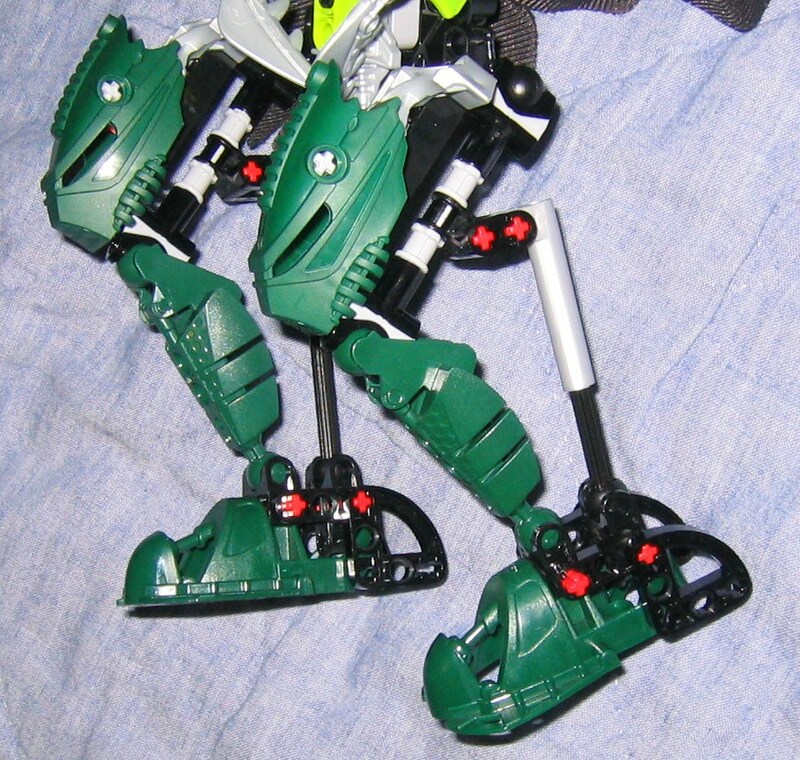 The back of the foot is simply some technic parts to hold the piston in place and to make his foot able to support more weight by extending the heel out more. The heel is too simple though, and should be constructed a bit better since it can pop out of place too easily. 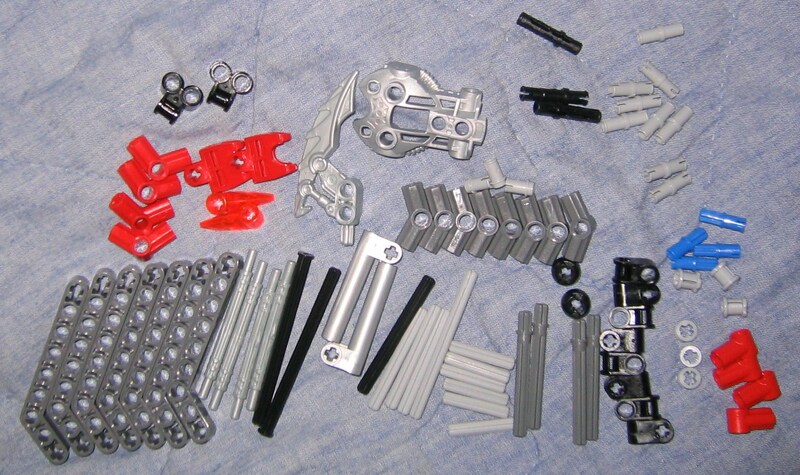 "Things popping out too easily" is actually my overall reason for the set being disappointing, since a few parts are wobbly or flimsily connected onto the set. Another portion of my disappointment is the cape. I never liked the cape and I?m always afraid I might tear it on something. It covers the back and a would-be hallow area and it's interesting how the red tubes protrude from the lower holes to his neck. 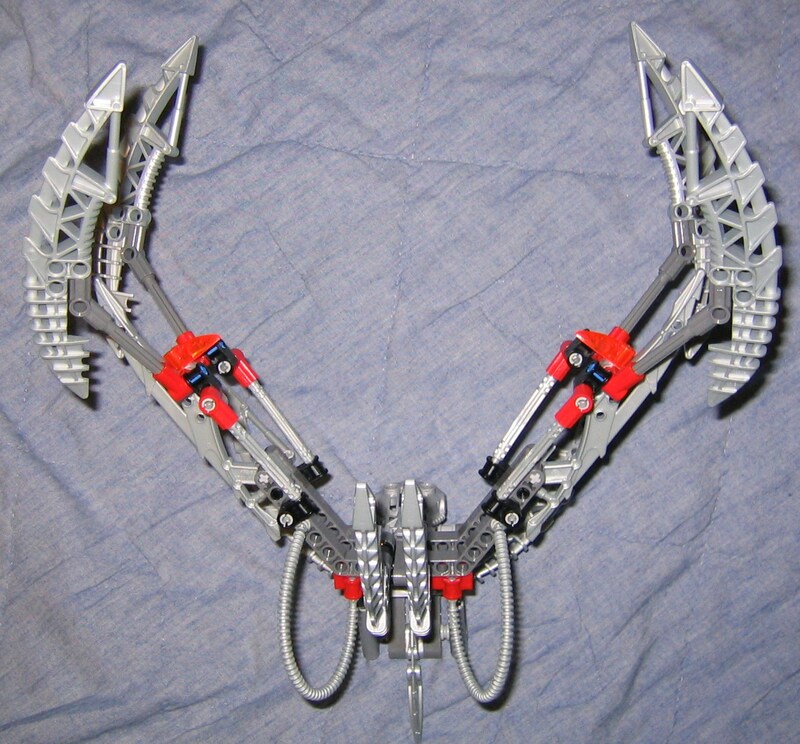 The neck itself is actually two necks, a pair of short double sockets connecting the head to the torso while the red tubes connect to the very base of the skull where it meets the double socket. 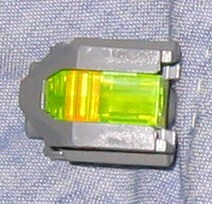 A "peg to plus rod" plug attacks to each double socket that makes up the middle of the neck, where one part sandwiches through the upper holes of the cape to the two dark grey Lehvak Kal claws to hold the cape in place, while the hole designed for a socket neck (Specifically Vezon's neck on the set Vezon And Fenrakk released the year before) is left unused. 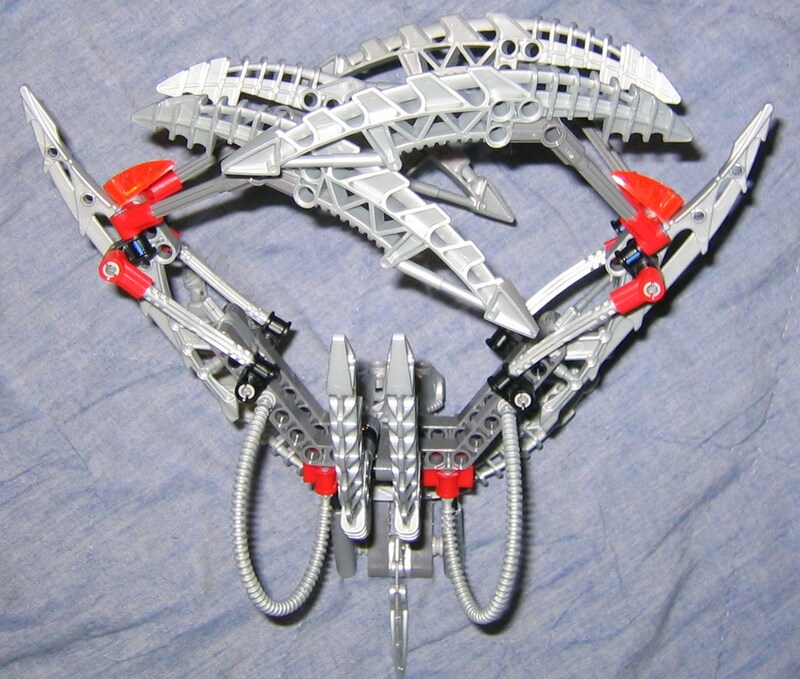 The head is two Pridak feet held to each other. I?ve always thought two Pridak feet together made an interesting short broadsword but after seeing it as Karzahni's skull I can?t see how it could be used any other way; it just looks perfect for the set. 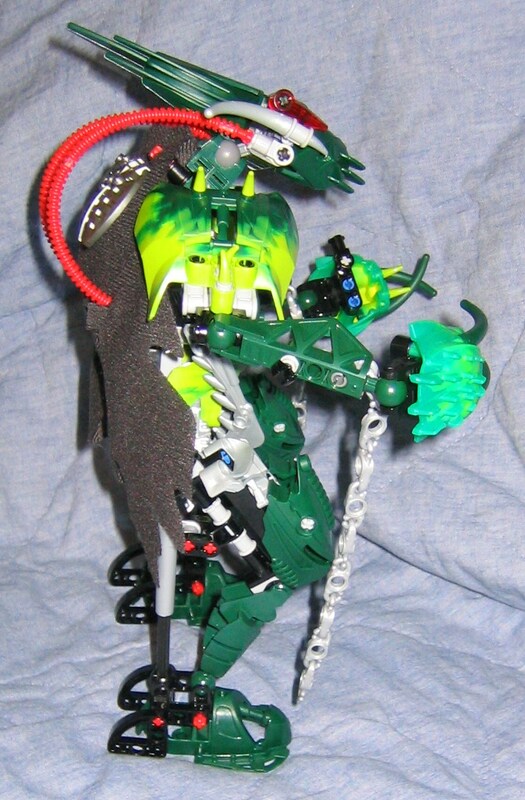 I?ve been told that Karzahni actually has a mask in the story, and I?ve seen speculation the mask may be fused to his head per a mutation for his set form, either way, his head is not actually wearing a mask, at least not one that can be taken off like traditional BIONICLE mask parts. 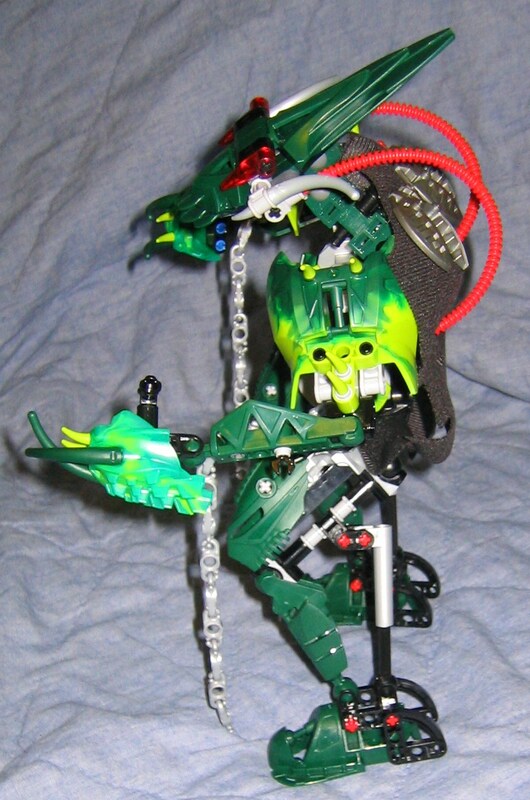 The torso and arms are very simple but the way they are armored and plated with the light green/dark green Mantax shoulders on the stomach and arms are a key role in the design, bulking him up and making him look more massive, but the underlying construction is simple and not that much different to a Toa's basic construction. 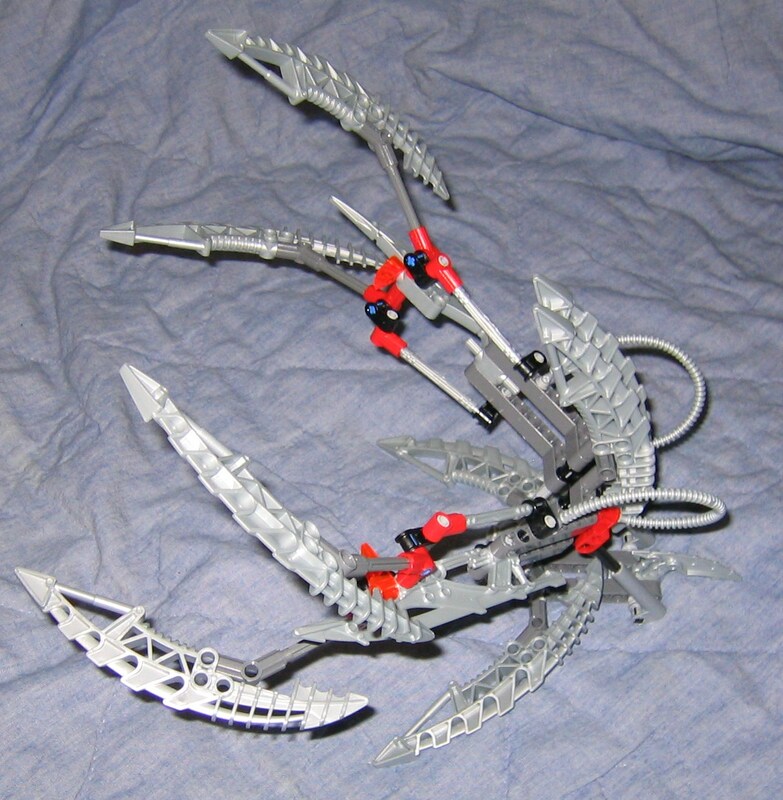 Of particular interest to his torso design are the two claws extending from adjustable sockets lower down and behind his arms. 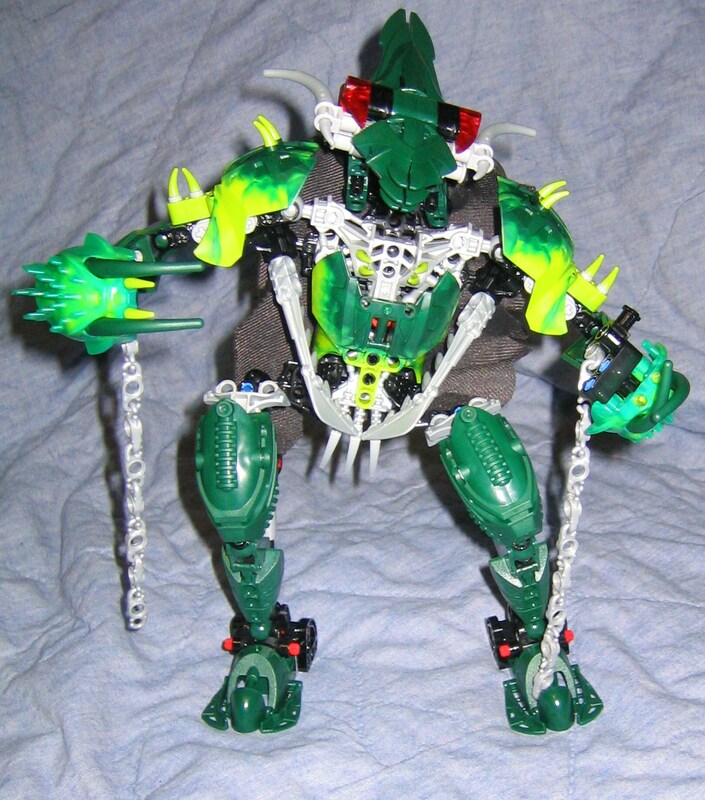 These two long claws get in the way of his arms but add an interesting twist to his design much like Brutaka's second pair of arms. 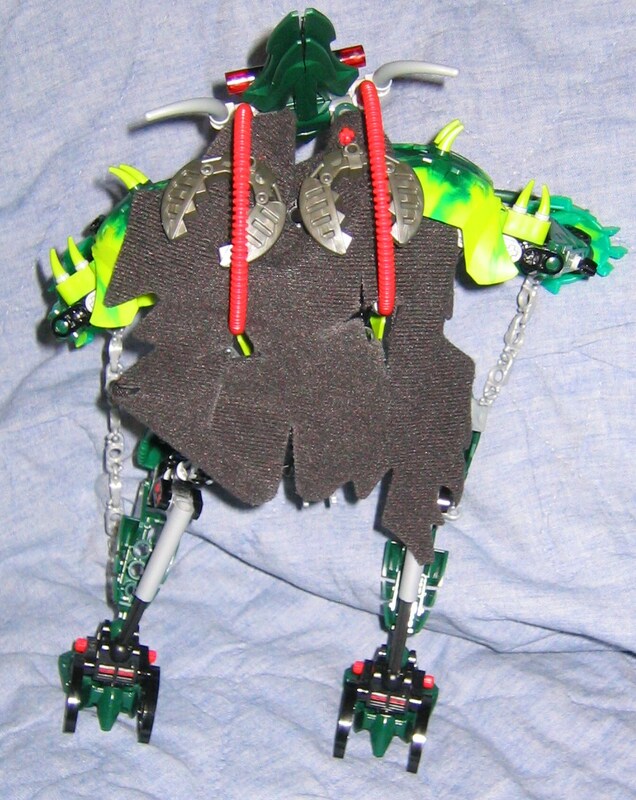 His skinny arms have a strange set of hands that consist of Barraki Ehlek's skull with dark green long claw/fingers plugged into what would be Ehlek's eye sockets, and two lighter green claws that match the barbs on his silver upper chest and shoulders plugged into the teeth holes on the front. 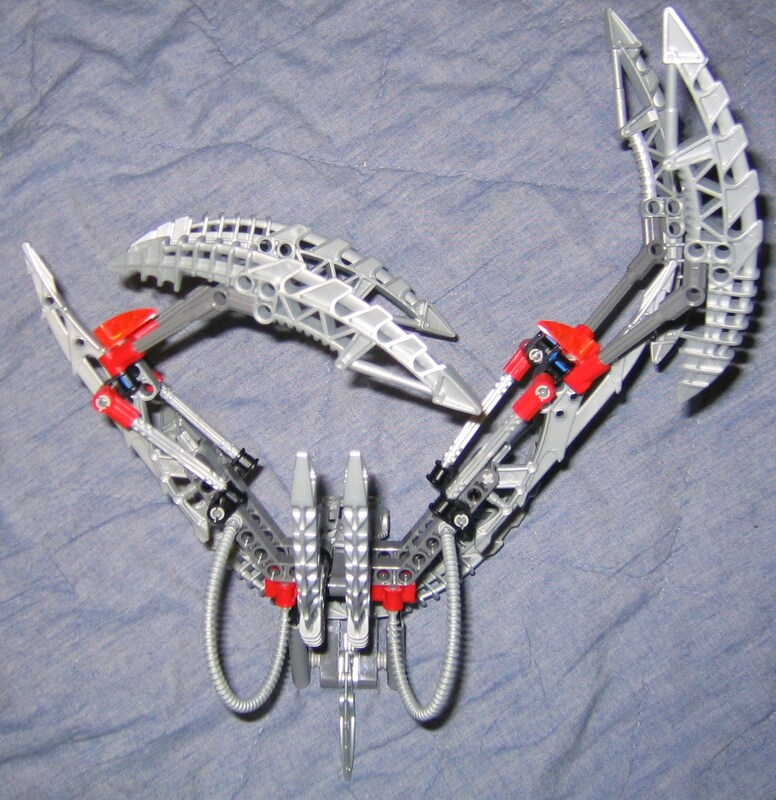 The left hand is slightly different and modified to hold a squid launcher. 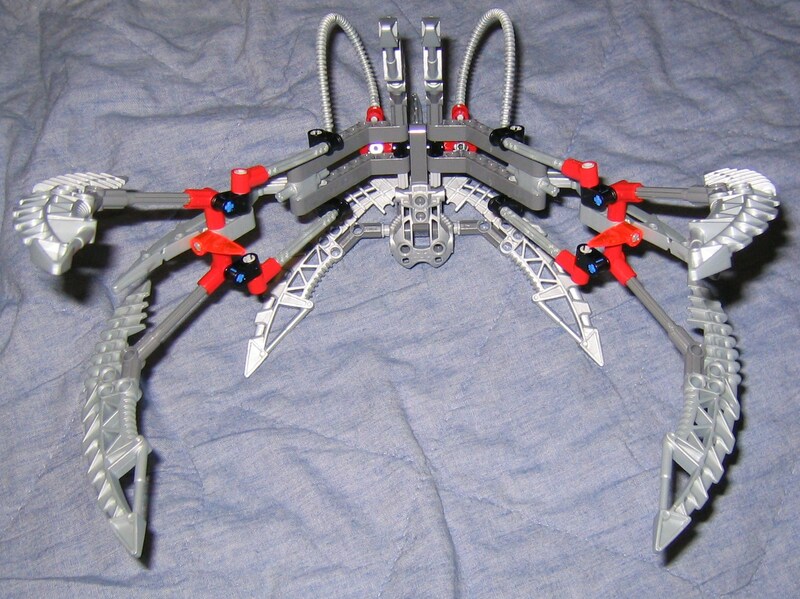 Attached to his wrists on his lower arms are two ten segment long chains that can be adjusted by detaching them and clicking them together at various lengths, as suggested on the front of the box where the two chains are joined together to attack on of the Matoran. 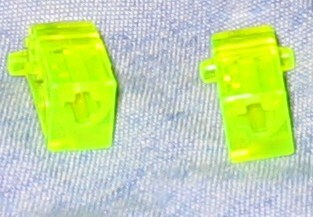 They aren?t horribly long when left as the instructions dictate, but for decoration purposes they are about the right size when left this way. 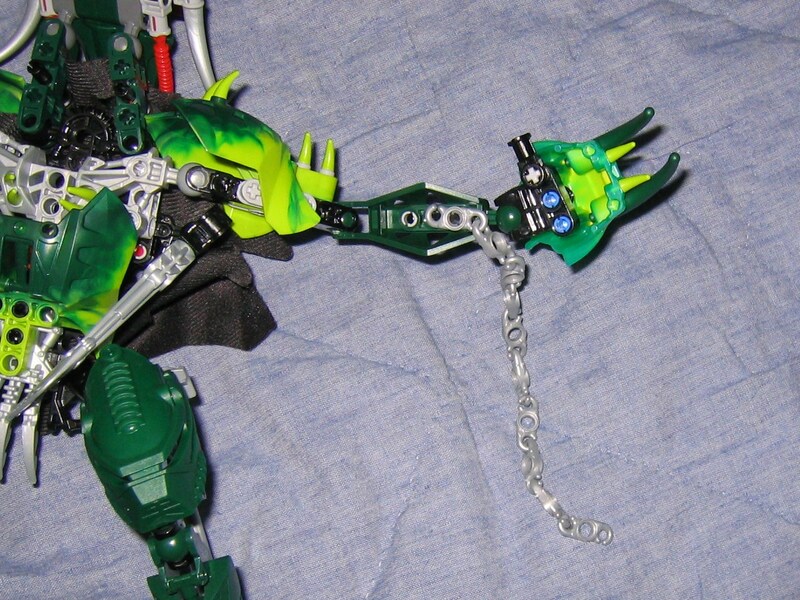 The upper arms seem to have been left without some sort of attachment to bulk them up since one plug port serves to hold the chains onto his arms, and a black miniclaw in another socket on each arm serves to hold the extra squid ammo, leaving nothing good to support any armor. I'd gladly sacrifice the squid holders for some armor, since I usually dump the almost useless squid projectile ammo and launcher into a random container. The squid launchers are too much trouble for me to actually have fun with them. 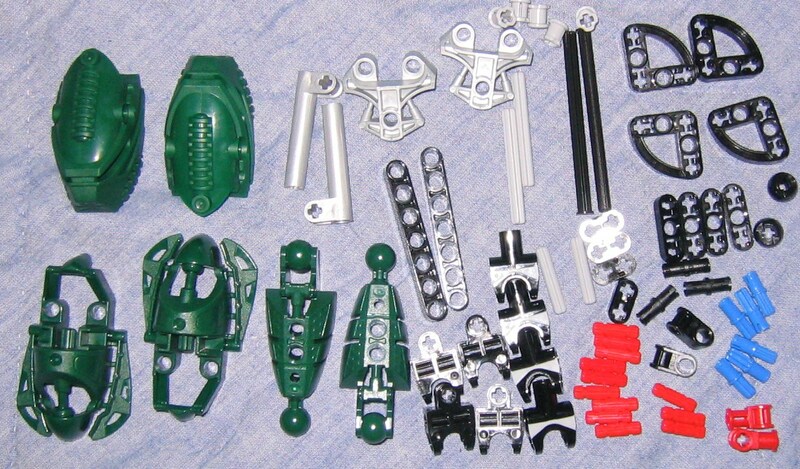 The two Matoran in this set are pretty much the same construction as the other Matoran that came out a few months back, except they lack a zamor launcher and instead have a rubber tube that extends from the new eye piece, through a clip to fold it out of the way, and into the back of one oh their leg sockets. 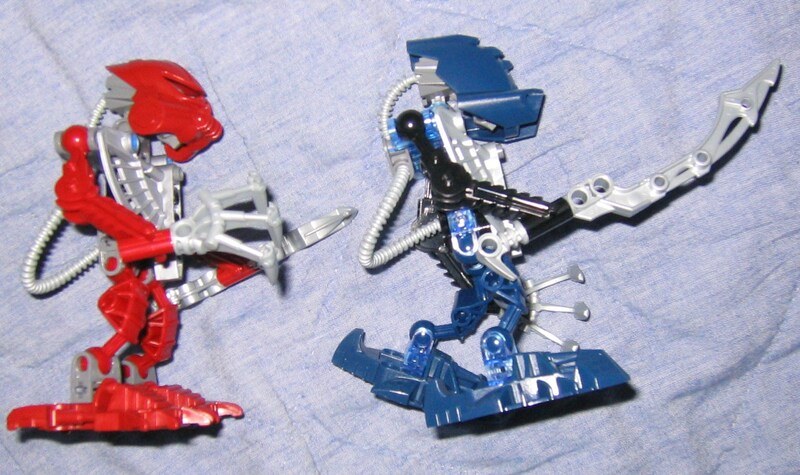 These guys may be simple but like the other Matoran, for some reason they are just fun in their simplicity. 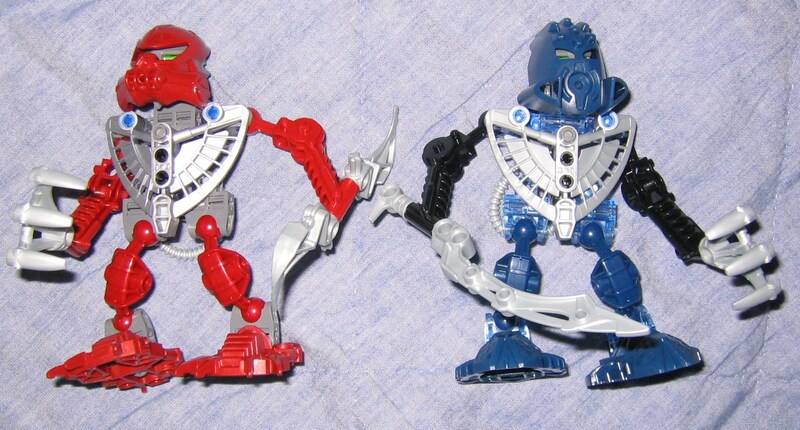 They each have a set of silver Onua claws in one hand, while the other hand holds a newer more recent tool. 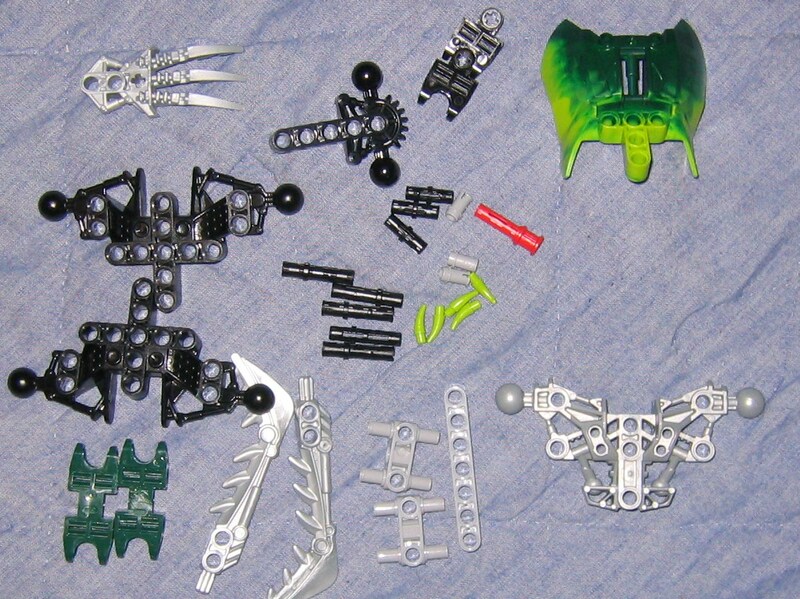 There?s nothing much new if you've been buying BIONICLE sets for a long time now, but there?s a variety of parts and plenty of Bordahk staffs if for some reason you need them. 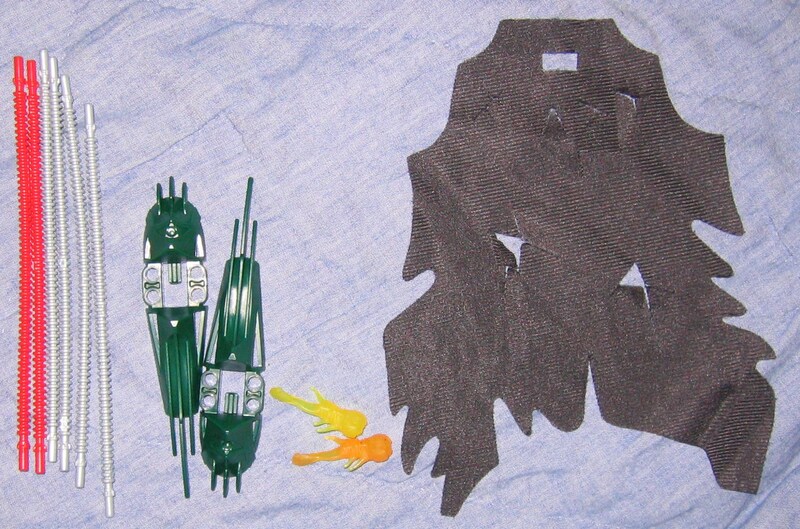 It?s hard to spot it, but there are also two newer blades that make up Maxilo's double sided sword. 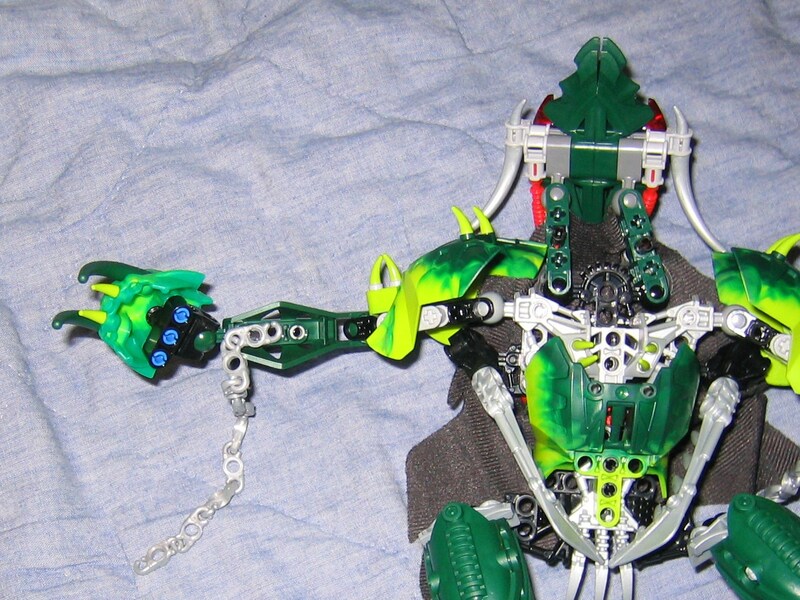 Nothing is really new and its stuff that?s been on the market before, just in different colors, like the green Pridak and Mantax feet as well as the solid green Vakama Hordika skull, the blue mask of night vision, the green mixed Mantax shoulders. 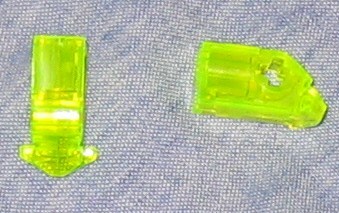 The only real new shapes are the red and silver flexible tubes, the new eye piece that?s shorter and has another port to attach stuff to, and the Maxilos sword parts. 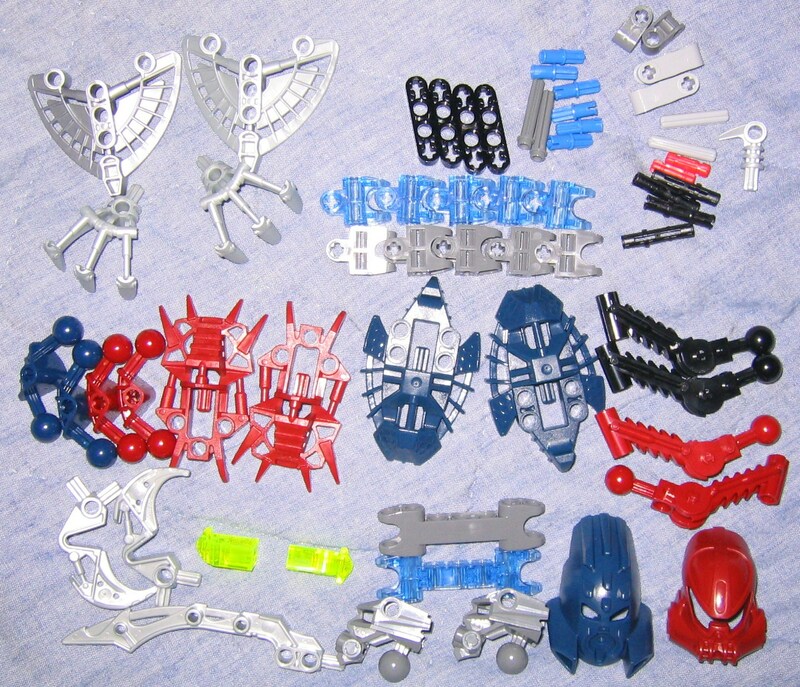 What bugs me in particular is this set lacks the Cordak revolving blasters which the other sets each have, the only exception being Gadunka. 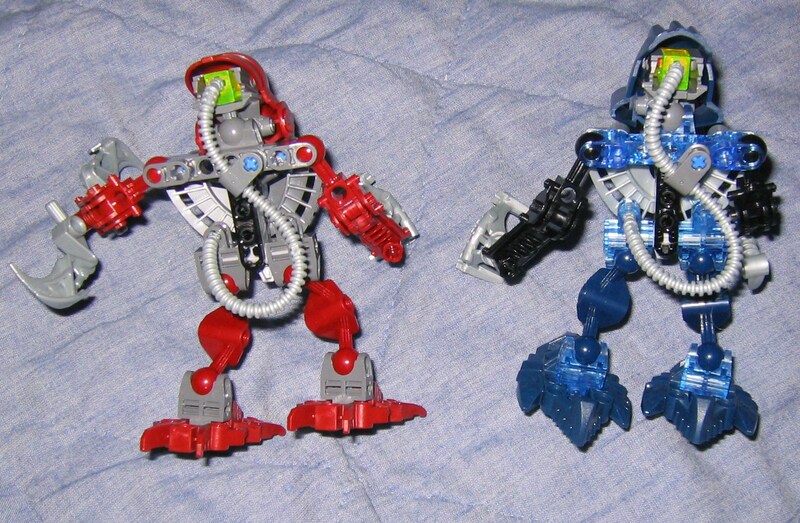 Anything?s better than the squid launchers, maybe per storyline these guys didn?t have the part or they wanted to add some variety in the sets rather than give EVERYTHING a Cordak blaster. 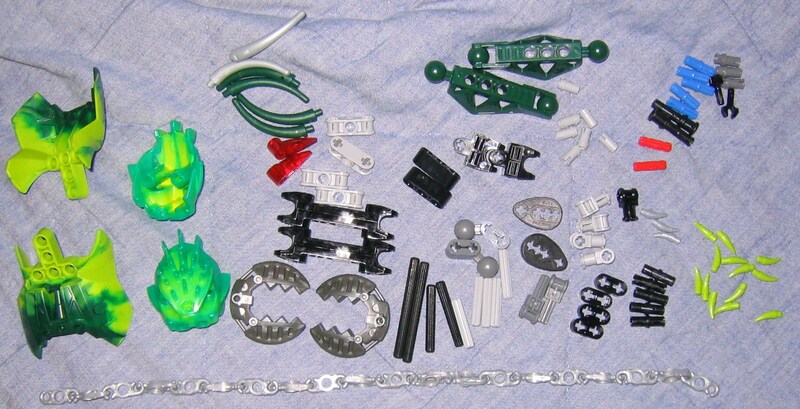 Whatever the reason, I'd certainly take a Cordak blaster in a set over a Squid launcher each time, given the choice. Thanks to Kopaka Lady for helping me spellcheck this.